Last year, fields were brilliant yellow in February. This year, La Conner forges bravely on with its Daffodil Festival, with blooms a bit late. Tulips? Sometime in April is a good bet. Everybody knows about the Skagit Valley Tulip Festival, whose semi-official motto talks about how the festival happens the whole month of April, but with “bloom dates according to Mother Nature” — meaning sometimes they bloom before April, sometimes they don’t bloom until later in April, and frankly nobody running the festival can control that. 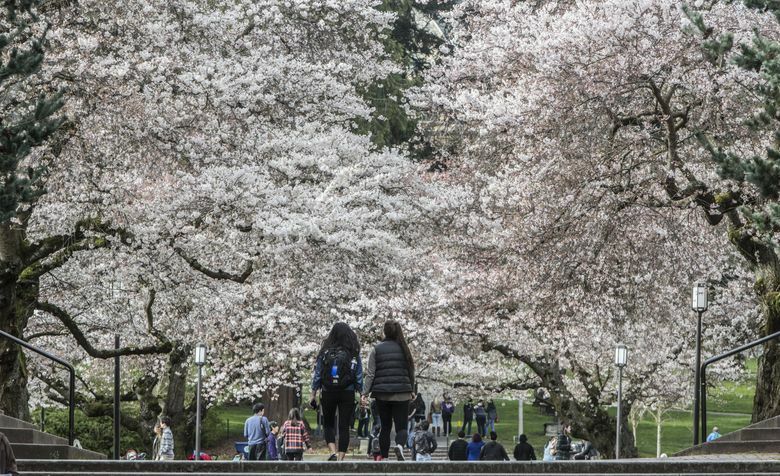 UW cherry blossoms unlikely to peak before late March. Daffodils reliably bloom first and stay blooming for weeks, so the town of La Conner felt pretty safe three years back when it declared the month of March as Daffodil Festival time in La Conner. The last couple years, Skagit Valley daffodils were in full bloom in February. This cool and rainy year, it’s the middle of March, the daffodils are dripping and cold and only just starting to open. “Two days ago there was no color in the fields, but just in the last two days there’s at least a haze starting to form,” flower grower Brent Roozen, of Mount Vernon’s Washington Bulb Co., said Wednesday. “I drove by them this morning — and you can kind of see yellow!” Heather Carter, executive director of the La Conner Chamber of Commerce, said with a waver of hope in her voice. The thing is, daffodils like the weather we’re having this week. 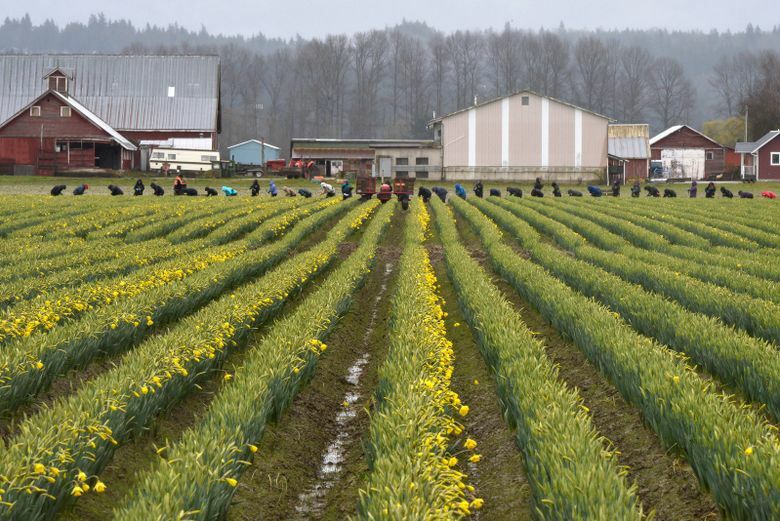 “Mid-50s and rain is perfect for daffodils, but we haven’t had temperatures in the 50s until this week,” said Roozen, whose company is the largest tulip-bulb grower in America, with some 500 acres of daffodils, 350 acres of tulips and 150 acres of irises in the Skagit Valley. It ships more than 70 million cut flowers across the United States annually, and tens of millions of bulbs throughout North America. It started harvesting daffodil flowers last week. On his company’s website, a bloom map shows locations of the fields and what flowers are growing where. When a field blooms enough to give a thrill to passersby — some of whom come from across the nation to witness the spectacle — the flower icon is “lit up” with the appropriate color. So far, the map remains colorless. “It’s coming close, we might have a couple fields of daffodils lit up by this weekend,” Roozen said. Last year, daffodils were in full bloom by the third week of February, so they’re about three weeks later this year, but only about a week later than normal. “We also have a photo contest but we’re waiting for the daffodils to be more photographable before we promote that much,” said the chamber of commerce’s Carter. So, thinking ahead, what about tulip time, which brings a whole rainbow of color to the farm fields? “If we have temperatures in the low 50s for the next 10 days, as the forecast shows now, tulips will probably bloom the second weekend of April,” Roozen hazarded to guess. 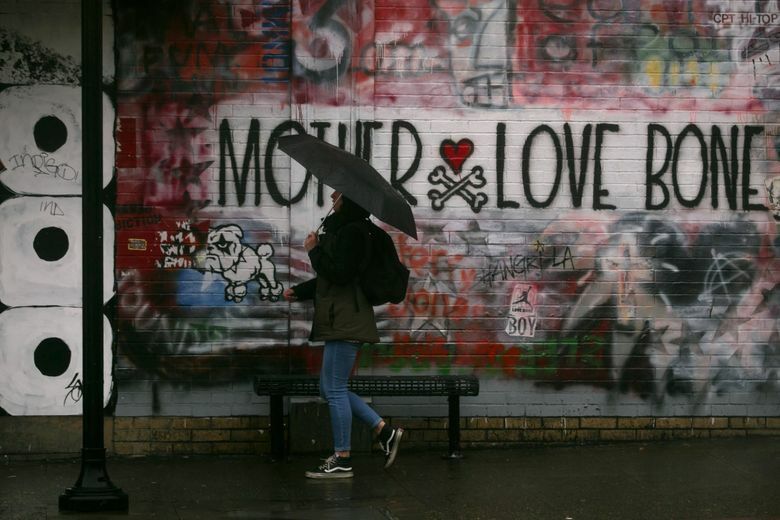 But, he added, with the wisdom of one accustomed to calculating betting odds, a change in weather would change that forecast.